O-beads - gorgeous little beads which are new on the market - they're flat, O shaped discs measuring 4mm across, 1.5mm high and they have a 1.5mm hole in them. As soon as I saw these, I knew they would be great when used in bead embroidery, but thought they could lead to interesting bead weaving designs too. I had today off work, so I thought I'd spend some time playing with these little beads, and I came up with a design which I think is rather nice. 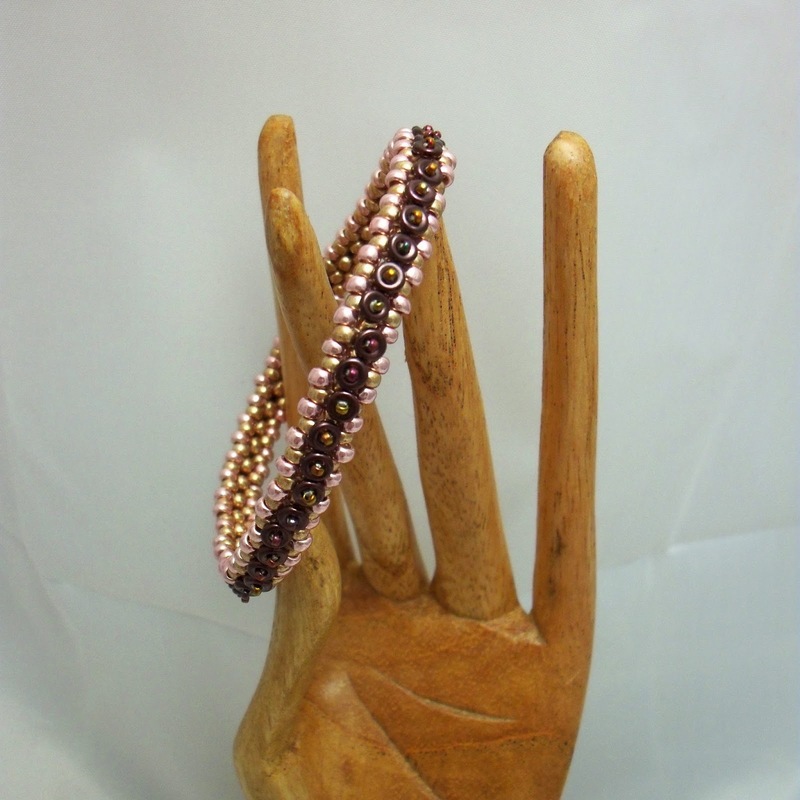 It's a skinny bangle, with a base of right-angle-weave, embellished with O-beads. In a fit of efficiency, this bangle has been designed, and the tutorial written up in the same day! The tutorial is available in my tutorial shop. I have to say a little bit about colour here - the picture above was not my initial colour choice when I was playing with this design - the colours in the picture below are more like my 'go to' colours. I do love the purples and the coppery golds though. 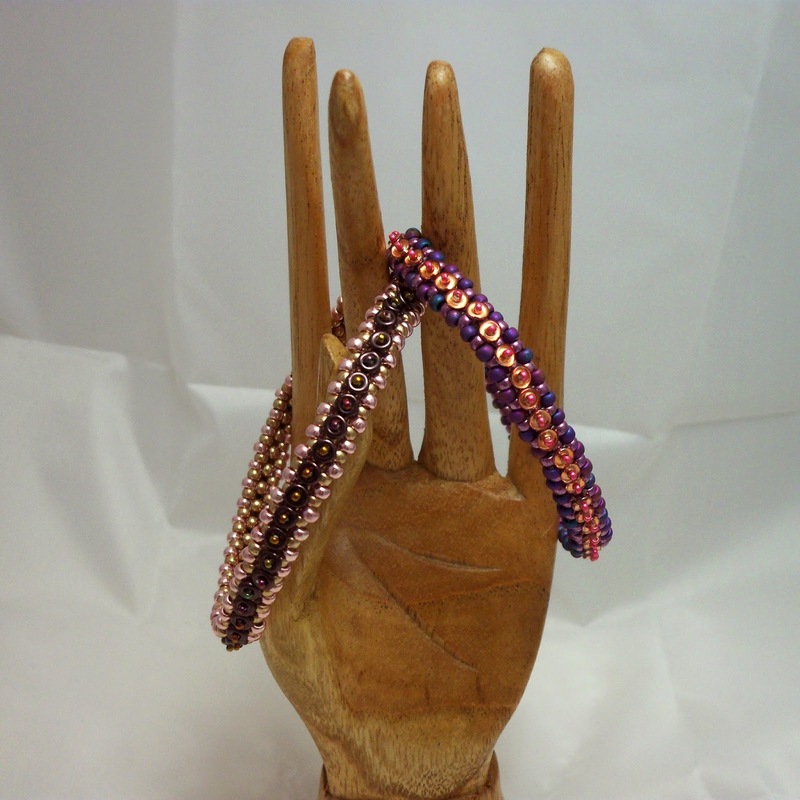 Also a little note about the O-beads themselves... the crystal capri gold O-beads used in the purple bracelet are different on each side - one side is clear, or crystal, the other side is the coated gold side. In my bangle, I used them clear-side up, giving them a greater look of depth, but they look equally good with the metallic side facing up.